Dr. Dianne Saxe is the Environmental Commissioner of Ontario (ECO), a watchdog over Ontario’s environmental, energy and climate performance. She is also a Certified Environmental Law Specialist. In November, 2018, Commissioner Saxe released her 2018 Environmental Protection Report, Back to Basics. 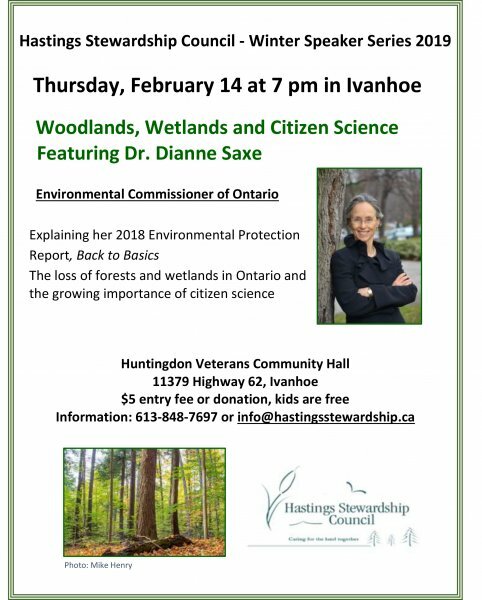 On February 14, Dr. Saxe will focus on the loss of forests and wetlands and the growing importance of citizen science. Wetlands and woodlands continue to be damaged by agriculture and development. Basic ecosystem function requires 30 per cent forest cover, and some parts of Ontario have only three per cent left. Three quarters of southern Ontario’s wetlands have been lost. Wildlife diseases can have critical impacts on biodiversity, human health and the economy. “Small changes can better protect Ontario’s water, wetlands, woodlands and wildlife,” concluded Saxe. “My report offers sensible solutions. Many cost relatively little and would yield big rewards.” Join us for the third event in the Winter Speaker Series hosted by the Hastings Stewardship Council.